Trout Unlimited is America’s leading coldwater conservation organization. Our goal is that clean, cold, fishable water exists for generations to come. We can do it with the support of committed anglers and conservationists like you. Join our local Green Bay Chapter of Trout Unlimited and become part of our over 200 member organization whose mission is to protect our cold water resources everywhere we can. Utilize part of your time and talents in helping the chapter succeed in accomplishing our mission. The health of trout fisheries is a direct reflection on the health of the environment and our ability as humans to sustain ourselves for the next millenia. Fresh, clean, cold water is fundamental to our survival. Help us protect these cold water resources, and give back to our communities, by joining Green Bay Trout Unlimited. 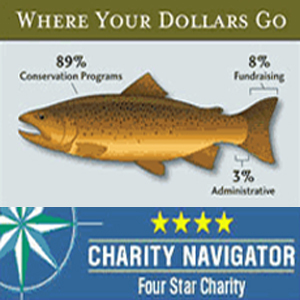 Trout Unlimited has earned a 4 star rating from Charity Navigator showing your money is being used responsibly and put to work for the resource. By joining today, you’ll receive a year of membership benefits. 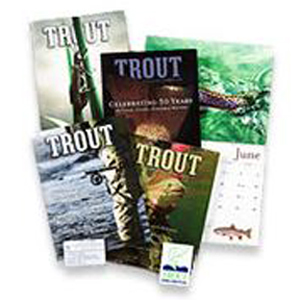 This includes four issues of the award-winning Trout magazine, your 16-month color fishing calendar (mailed in late summer), the official TU member card, a car decal and a TU sticker. Choose from the member options below to join Chapter #083 and enjoy the benefits of belonging to the country’s number one cold water conservation organization.